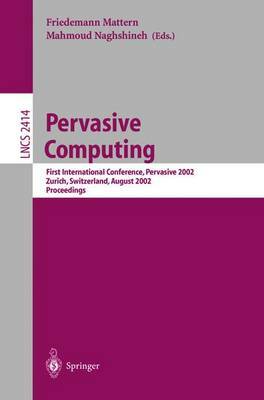 This volume contains the proceedings of Pervasive 2002, the ?rst in a series of international conferences on Pervasive Computing. The conference took place at ETH Zurich from August 26to 28, 2002. Its objective was to present, discuss, and explore the latest technical developments in the emerging ?eld of pervasive computing, as well as potential future directions. Pervasive Computing is a cross-disciplinary area that extends the appli- tion of computing to diverse usage models. It covers a broad set of research topics such as low power, integrated technologies, embedded systems, mobile - vices, wireless and mobile networking, middleware, applications, user interfaces, security, and privacy. The great amount of interest we are witnessing in Per- sive Computing is driven by relentless progress in basic information technologies such as microprocessors, memory chips, integrated sensors, storage devices, and wireless communication systems that continue to enable ever smaller, lighter, and faster systems. Such systems are also becoming a?ordable due to their high integration and mass production, paving the way for their adoption.